WHAT DO YOU WANT [and does He want you] TO BE? We’re all asked that question over and over again in life, and as we move through adolescence and into being a “young adult,” it seems the answer often becomes less clear. Closing in on 26 years of age, I’m still asked this question, although usually in adult-speak, with people asking me things like, “so what do you do with that degree,” or just, “so what do you want to do with that,” and I still don’t really know the full answer. I don’t know if I ever truly will. So I made sure I could make it happen. I always did well in school, and eventually was accepted into a highly competitive architecture program, where I was soon kicked out after the first year because of a GPA 0.2 points lower than it needed to be. So began plan B – go to my in-state school, get an engineering degree, and then head off to grad school to finish it off with a Masters of Architecture degree. And then I got to know God. I’ve always been a “Christian.” I grew up in church, never swearing or drinking, and never getting into trouble. I was nice to people, smiled a lot, and prayed every once in a while. But I didn’t really know God. I didn’t start to know Him until my sophomore year in college – and that’s when my ‘dream job’ went out the window, because it was just that – mine. I started to realize that it was my dream job – not His dream job for me. I started to realize how much smarter God is than me and how much better He knows me and my potential than I know myself. And because of this, I started to get scared. If God was calling me away from architecture, then he’s calling me towards something I’m not so sure that I’m good at. I was all prepared to design some buildings, give my ten percent, maybe join a bible study or two, and live my life – but God doesn’t let us off easy. He doesn’t let us off at average. If you don’t believe me, read the Bible and His plans for the people in it. He always sent them to do something that scared them, and they usually hesitated to act for a while. But eventually, they did it, and realized God made us stronger than we thought. God sees potential, and strives to make sure we reach it. We, as humans, see pleasure, or money, or fame, or convenience, and think it’s potential. We see what we’re good at, and try to use it to cash in, or maybe we even try to use it to “serve Him.” And sometimes, using the talents we know about is exactly where He wants us. But sometimes it isn’t. Sometimes he’ll ask us to do things we know we’ll have to work our butts off for – things seemingly unachievable – but we ultimately know that it’s where our purpose lies, so our cowardice to move from vision to action can’t last too long, because eventually, as we get to know Him, our dreams and His align and we realize it’s a better dream after all. Are your dreams aligned with His? Are you still pretending you didn’t hear His voice, continuing to move forward on your own path? Acknowledge the voice. Focus on it. Quiet your own fear if you have to. Is He asking you to keep walking, or to switch paths? Can a tree live without roots? Can it continually grow stronger, prevailing against the winds, if the roots aren’t there? No plant can go strong without it’s roots finding water, and in the same way, no Christian can grow strong without their roots being in Christ! Without Him, you can grow tall, but it is all based on pride and selfishness, and you will soon fall at the first true storm. But only when you realize continued growth and provision is found deep below, and you seek out to find it as a root does water, can you grow through a humble spirit and in the knowledge that it is only through Christ’s provision which you have been made strong. And then, when all roots are firmly gripped and entangled in Christ’s deep love and wisdom, can you withstand any storm the world may produce. Are your roots shallow, while you take pride in your knowledge of Christ, or are they deep seated in the wisdom that only through Christ can such knowledge – and ability to love – truly exist? The fear of Christianity is a peculiar thing. Lately I’ve been in an incredible state of recognition – recognizing the odd nature of God’s requests in my life. I’ve recognized that, quite obviously, He has continuously, without fail, called me to do the things that have always terrified me. My original goal was to tithe regularly. Now I’m asking people to support me so I can help college students realize the potential in Christ which I took so long to realize myself. If you haven’t experienced it, asking people for financial support is a terrifying endeavor. Yet God has changed me through the years. The things I once feared are now the things I couldn’t imagine being torn away from. The things I once vowed never to do in my life (i.e. preach) are now the things I see in my future. The things I always wanted to do, and had planned as my stability in life (i.e. architecture) has become an afterthought, and frightening in its own right. So maybe God will call me to do that eventually. Once it becomes a more terrifying thought. I guess the point is, God has completely changed my motivations. Architecture, in my life, represents the path on the safe side of the river – the path towards self-glory. It represents the path towards worldly success and recognition. It represents the path I chose for myself when I was seven years old. Yet God has brought me to the other side of the river. And it is terrifyingly wonderful. Ministry, and serving the world for the sake of the Gospel and Christ’s love which must be felt by everyone on this rotating sphere we inhabit, is the path of complete self-denial – the path full of snakes, and 100 foot drops, limited visibility, and bears. What’s more terrifying than bears, right? Yet it is the path towards the greater reward. It is the path of unexpectedness. 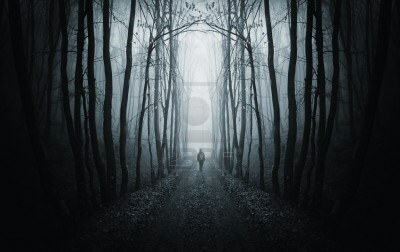 It is the path that keeps me wondering what will come next. It is the path with an always moving and adapting storyline. It isn’t the path of least resistance, but it is the path of most interest. It is the path that seeks to expose my potential. And that can only be found by fighting off a bear in the fog every once in a while. Looking back, it’s kind of funny that I just used a bear analogy. In high school, whenever me and my friends would go camping, I was known as a sort of bear whisperer. I’d make up stories of times where a bear would come up to me, and instead of attacking me, I’d just talk to it like it was a human. I’d just talk to it as if we’d been friends for years, asking him about how his family was and that sort of thing. Of course this was just for laughs. 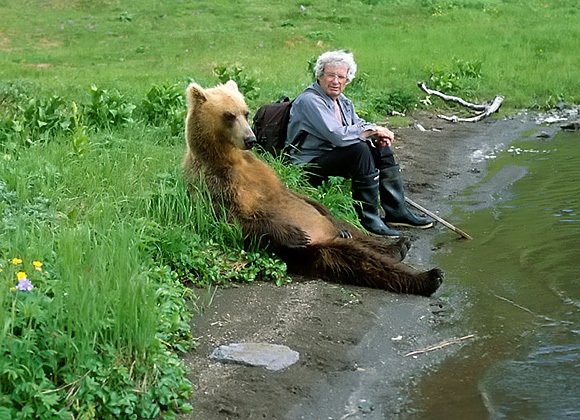 I’ve never come across an actual bear, despite living in Wyoming, and I’ve certainly never had a friendly chat with one. Yet in my current stage of life, and the stages yet to come, I must respond to the bears along the path in the same manner as I joked in high school. I must treat them as old friends, pushing me to embrace that which terrifies me. Because if there’s one thing God has taught me other than that He is full of grace and love, it is that the sooner we embrace the terrifying task He has put before us, the sooner we will see the good that comes from it. The sooner we talk to the bear as an old friend, the sooner we won’t be able to imagine our lives without that bear. What is the bear standing in your path that you must face? Have you embraced the fear and confronted it as an old friend? Or have you decided to avoid it and cut back across to your old path from before Christ changed your course? If you’ve cut back across, there’s good news: His path is always just across the river. All you need is a bridge – and God has provided us with a carpenter. God has it under control. Don’t worry, because His will is unstoppable. How many times have you heard this? I know, as a Christian afraid of a lot of things that largely have to do with what God is calling me towards, I have said this a lot – and with the best of intentions, but the worst of reasons. The Christian subculture is a funny thing to me. We talk about how much we trust God all the time, and when He tells us to actually trust Him with something big, we find ourselves saying, “I’m good” and acting content. We’re a culture who really loves saying certain things – certain “Christian-isms,”without having the slightest idea what any of them mean., and most of these are said as excuses with good intentions,as if we believe if we say something that sounds Christian enough, God will overlook our failure to do what He has called us to. We’ve never even taken the time to notice God above us shaking His head, wondering when we’re going to finally get it – when we’re going to realize we’re just tricking ourselves. My favorite Christian cop-out, and most used in my own life, is the Christian saying that goes something like, “Either way, God is in control.” Our intentions, through saying this, is to tell our Christian friends all about God’s power and uncontrollable plans for our world, while our reasons for saying it are often completely different. And by living out of our cowardice and faithlessness rather than our intentions, our lives are stalling at far less than the potential God sees in us. We’re ending our road trip to the Rocky Mountains by cornfield camping in Kansas, deciding the field next to us is good enough because we’re too afraid we’re not in good enough shape to walk up hills – let alone mountains that start a mile above sea level. So why are we so seemingly content with our inaction and worldly potential when God has given us a preview of what we’re capable of with Him? The truth is, we’re not. We’re just tricking ourselves because our main motivator is fear. We’ve tricked ourselves into believing we aren’t necessary or capable of doing what we’ve felt called to do because we’re too afraid we don’t have the right hiking shoes, and surely God would only ask someone with sufficient hiking shoes. We’re too afraid because we can see how long we’ll be hiking uphill as soon as we begin the climb, so we decide we’d rather just keep hiking along in Kansas. But the problem with Kansas is there’s never a view from the top. Sure, you’re living safely and without sore legs (or pride) or empty lungs (or fallbacks), but you’re also living life without ever knowing what it feels like to reach the top and look out over hundreds of miles of Kansas, taking a million pictures of where God has taken you (If you’re from Kansas, by the way, I’m not mocking your state. I’m just recognizing the comfortable walking conditions which exist there). You’re probably saying about now, “Oh chase your dreams. Never heard that before. The only problem is, they never tell me how.” Well, no need to worry. Because I’m going to tell you. Step 1: Recognize something you feel called to do, and pray about it. A lot. But don’t use prayer as an excuse for inaction. If God’s asked you to do it, you don’t need to pray for Him to nag you about it for the next two months. Step 3: Tell people about it, ask people to pray about it, and see if anyone wants to join you (assuming it’s something big and seemingly insurmountable without God’s help. If it’s something small, just do it. You’re probably only reading this to keep putting it off). Step 4: Tell more people about it. (Basically never stop telling people about it.) Figure out a game-plan. It might start with “tell people about it,” but it should move along to something like, “write a mission statement,” or, “apply for a non-profit ID number” or “buy plane tickets,” or “write a support letter.” Just make some basic steps like that. After you have a blueprint, tell more people about it with your new clarity and vision for God’s plan. Step 5: Do the first thing on your blueprint. And after you do that, do the second thing. And then keep doing. Eventually, you’ll be able to recognize that you’re moving uphill. Step 6: If you put your all into it, and it doesn’t work, don’t get mad at God. Instead, thank Him. Pray about it. Write down things you may have learned along the way, realize it wasn’t that scary, and get ready for whatever’s next. God will probably use something you learned in the future. The truth is, we’re all afraid of the majority of things God will tell us to do, but it’s usually easier than you’d think to start doing them (which is something I’ve realized in my head, but still struggle to apply). I was talking with my bible study the other day, and mentioned how my life is completely different than I expected. They asked me how, and my response was, “Well, I’m basically doing all of things I was afraid of trying four years ago. And now I never want to do the things I thought I’d be doing, because this plan is so much better than the one I had for myself.” God is continually challenging me, and I’m continually hesitating, making excuses, and making slow progress towards where He’s leading me. But I am making progress, and the quicker I can build up steam, the quicker things will move forward. Remember that if you are moving forward, God is patient. He won’t abandon you just because of your pace. Just don’t stop in Kansas – be sure to drive straight through with the vision of the view ahead.